A young child is found in the woods. Left to die, left for safe keeping, or left for someone to find and save? The child can't speak and is barely alive. Clare Hart is assigned to figure out who did this and why. She is also asked to find a gifted cellist who has gone missing from her grandfather. The girl is out of her age range, but she feels compelled to help find out what happened to her. Additionally, Clare is in a bit of a personal mess. She is in a relationship she can't take to the next level. Clare is near to losing her job when she learns her department is being shut down. She is close to losing her man and too wrapped up in these cases for her own welfare. Clare is a very likeable character. Clare's character is developed enough to carry all this through and still be believable. Clare really knows sexual trauma. The subjects that Clare tackles are uncomfortable but fighting beneath those subjects is a woman looking for the truth. She doesn't answer to every injustice, these things exist and for some there is no redemption or retribution. Her love interest, Riedwaan, is deep undercover and a bit missing in most of this story. Clare is left to figure this out by herself. She has a little help along the way, without which she could not have carried this out. Written in third person, we follow Clare as she follows the leads. The author was able to tackle some difficult subjects and keep me guessing. I really enjoyed this story. I didn't know what to expect from this book. Reading the synopsis made me think, it better be well written to pull off child abuse and detective work. 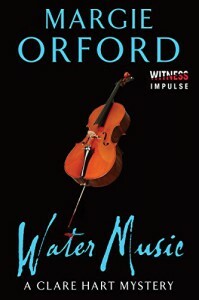 Water Music was not only well written, it also managed to be a love story. I can not stop thinking about it. I devoured this book in less than 2 days. That is fa-nominal, considering it is over 300 pages and my schedule is very demanding. Set in South Africa, the rules and language are a bit different there. The author was able to take me there without alienating me in the culture. What I really liked about this story was how it surprised me at the end. There was no jumpy puzzle solving. Clare and I thought the same thing, and drew the same conclusions. I really hate mysteries when all of a sudden everything comes together. This wasn't like that. Also, the author didn't try to horrify me with details on the traumas. She just stated the facts. There is a way to handle these things tactfully, Margie Orford nailed it. This book is part of a series of books staring Clare Hart. This is book #5, it can be read as a standalone. I have to get more from this series. This book is so good. It had so much suspense. I could see this becoming a blockbuster hit.